At Live-French.net, we offer different online French courses with a native-French teacher by Skype or the Telephone. 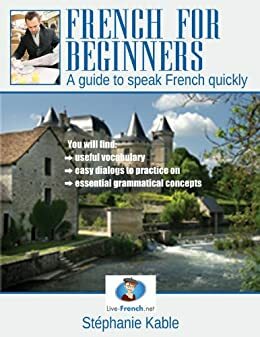 - French for beginners: French is a beautiful language and it's never too late to start learning it. With our French for beginners program, you will get into the basics of the language through dialogs and exercises. - French conversation: a personalized course to help you improve your French - for intermediate and advanced levels. - French exams: There are lots of exams to assess your level of French. The most popular are the DELF-DALF exams. Prepare your French exam with Live-French.net. - Business French lessons: This course is aimed at helping professionals to be more confident in French while using the language in a work situation, whether with partners, clients, colleagues, on the phone, on a business trip, etc. All these online French courses are organized as private lessons with native-French teachers. Find out more about our French tutors. Enjoy every comfort that online learning provides. Learn French by Skype, or if you prefer, you have the possibility to take French lessons by phone.